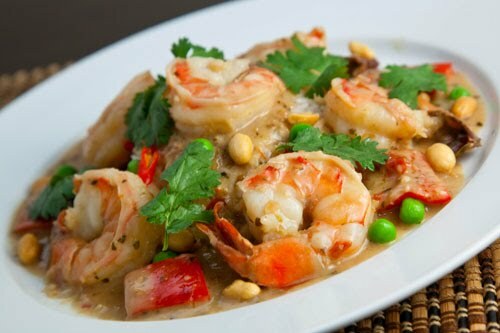 Thai curries are quick, easy and super tasty. At their core is coconut milk, curry paste, fish sauce and sugar. You just need to add some meat and vegetables. This time I went with shrimp fort the meat and some red pepper and peas that I had on hand. Panang curry paste is similar to a red Thai curry with the addition of peanuts so feel free to add a spoonful of peanut butter to the sauce for even more peanuty goodness. I served the panang curry on a bed of coconut jasmine rice which helped to soak up all of the extra curry sauce. Heat the oil in a sauce pan. Add the panang curry paste and saute until fragrant, about a minute. Add the coconut milk, lime juice, fish sauce and sugar and simmer for 15-20 minutes to thicken. Add the shrimp and red pepper and simmer until the shrimp is cooked, about 5 minutes. Serve garnished with peas, cilantro, chilies and peanuts. That looks delicous and colourful. Kaffir lime would definite add a wonderful fragrance to this dish. Hmm, I always thought satay was Thai. Kevin, your curry looks fantastic! I can almost smell it from here. I’m trying to cut back after the holidays so it’s no coconut milk for me for a while. But I do love it. I once made a cold avocado soup blended with coconut milk. It turned out great. Wish I had my blog then because I can’t remember what all I put in it. Oh well. Keep on cooking. Big fat shrimps in curry, mouthwatering for me. Steam some basmati rice with that and dinner is served. You’re becoming Curry Kevin! That looks *amazing*– and what a beautiful picture! Kevin, shrimp curry is one of my favorite dishes. You have presented it beautifully! YUM! This looks incredible, I love Penang Curry!!! mmmmm! regardless of which country the dish is from, i love panang curry…. and your photo is beautiful! Is it Panang Curry instead of Penang Curry? “Penang” is Malaysian and also the name of one of its states. Love your pictures! Your cooking looks professional! Oh Kevin – you with all your Asian flare – I LOVE it! You're a man after my own heart. Thanks for another stellar dish! Yummylicious! Great recipe to share! It's quite funny how Thai named certain curries or dishes after Penang. Instead of Penang, they said it as Panang or Panaeng since it's difficult to standardize and romanize Thai language. It's just the same as Mussaman (Masaman) which means Musalman or Muslim (Musliman) since this dish influenced by the shared border with Malaysia in the south. Muslim dishes can be found a lot in Phuket and Southern Thai. Maybe you will visit Southeast Asia just like Rick Stein? Making dish today cant wait my mouth waters tremendously everytime i see that picture great work sir!!!!!!!!!! !